The first time I went to Glastonbury was back in the 80s as a kid. Later, I moved to Glastonbury town and got a job in the Assembly Rooms and somehow ended up being the chief organiser of the kid’s field in the green fields that year. This meant I had loads of tickets – about 30 if I remember right and a payment for all my hard work. I moved on site six weeks before the festival began. That year I was the very first traveler to park up on site and I was in my first ever homemade camper van, my youngest son who was not even one yet and his mum was with me. Wildflowers covered the area we were at, parked right under an ancient oak tree and cows were still on the field. I first meet Mike Eavis the farmer, on the land who came over in his tractor to ask me who on earth I was. To this I replied by asking him the same question! Once he realised we were there to build the kids field he left us in peace. Over the next six weeks, we watched this city being built around us. First to arrive was a huge wooden poles, like a telephone poles. Then toilets, people, groups, and teams of people – our pitch was the children’s fields. My team, who came mainly from Cardiff – art students and performing artists that I knew, turned up in drips and drabs and we built a huge kids area. We had potters and earthbound kiln makers, jugglers, storytellers and a wizard know as Bran, the Druid. We had arts and crafts. We also had carpenters who built these huge wooden children play frames from the many wooden poles that had been delivered, that also housed the biggest swing that I have ever seen. I can safely say this was the biggest organic event I have ever been involved in organising. I say organic when what I really mean is magical because I have no idea how on earth it came together, other than to say it was a collective whole movement of people. Just as it began so does it end… slowly. Once the heart of the festival had ended and most of the revelers had left, the cleanup operation began. 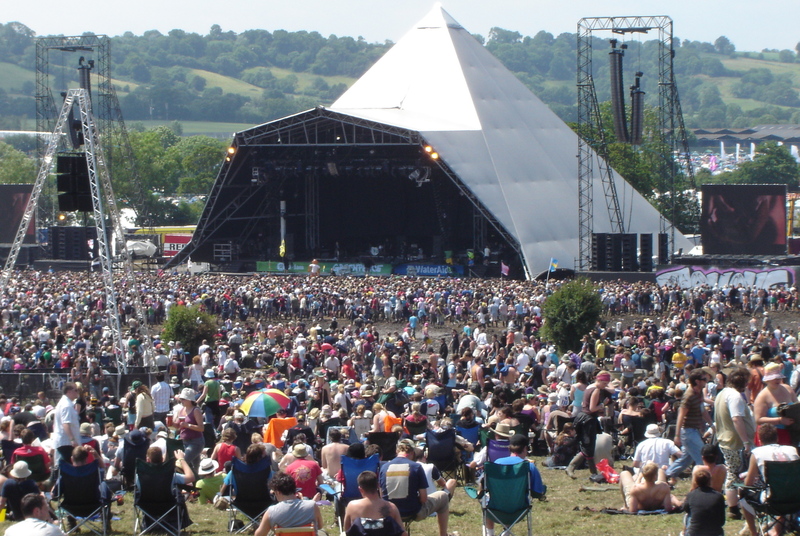 Back then and still today, the real unsung heroes of Glastonbury festival spring into action – the litter pickers – teams of hundreds who would begin to clean up the carnage that had been left behind. This paid work would take weeks and the focus was that every last bit of trash would be cleared right down to the cigarette butts – everything. This crew back then was largely made up of travellers – you may know them as new age travellers. Unfortunately, after the festival that year a few travellers were beaten up by security, an action that started off a riot between some of the travellers and security. Anything that belonged to that security company was destroyed as a form of protest and the police were called in and over 50 arrests were made. However the situation was calmed down and the litter pickers continued their work and that security team to the best of my knowledge lost a very big contract that year. In recent years I have not attended the festival but to this day I do consider the area as a second home. I have a permanent caravan parked up there just ten minutes from Glastonbury town. Whenever I drive past the site grounds after the festival and see the clearing up operation taking place. It always reminds of some of the loveliest people and one the best festival experience I have had to this day. Power to the modern day litter pickers for they are the eco-warriors of Glastonbury festival. Previous How to positively focus on – what you want to do.